"DiM" is a latest generation simulator which provides the experience "real-time feeling" of vehicle dynamics in Model Base Development (MBD) phase. 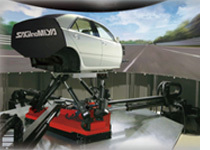 Hexapod and Tripod combinations, together with Floating system, can create innovative performance of “DiM Platform” driving simulator. With long stroked Tripod, “DiM 250" can reproduce long lasting "Acceleration" to be valued in wider range of situations.